How many US Presidents have been assassinated? 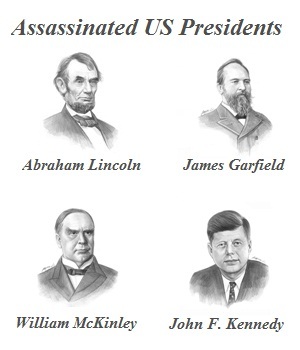 Which presidents were assassinated? Discover the names of the presidents assassinated in the United States. Which presidents survived assassination attempts? This article provides interesting facts and information about the history and events surrounding the deaths of the assassinated Presidents and also the assassination attempts that failed. Assassinated Presidents - The Assassination of Abraham Lincoln: President Lincoln died on April 15, 1865, the morning after being shot at Ford's Theatre in Washington, D.C. by John Wilkes Booth, who was an actor and a southern sympathizer who supported slavery. President Lincoln had taken his wife to Ford's Theater to see the play "Our American Cousin" and John Wilkes Booth shot the president in the head at 10pm. John Wilkes Booth then leaped onto the stage and shouted, "Sic semper tyrannis! ( meaning Thus, always, to tyrants) The South is avenged!". John Wilkes Booth fled theater and jumped on his waiting horse before anyone in the shocked theater could stop him. He fled to Richard G. Garret's farm in Port Royal, Virginia where he was killed. Facts about Assassinated Presidents. Assassinated Presidents - The Assassination of President James Garfield: President Garfield was shot on July 2, 1881 by Charles J. Guiteau at the Baltimore and Potomac Railroad Station. Charles J. Guiteau was a preacher and lawyer. He had supported President Garfield who had used two speeches prepared by Guiteau during his election campaign. Following the election of James Garfield, Charles J. Guiteau insisted that the President should make him ambassador to France. (At the time the 'Spoils System' was in operation by which a political party, after winning an election, gave government jobs as rewards to its valued supporters.) President Garfield refused and the mentally unstable Charles J. Guiteau stalked the president for months before shooting him. President James Garfield did not die until eleven weeks after being shot. Inept doctors probed his wound with dirty, unsterilized fingers whilst trying to locate the bullet. Alexander Graham Bell devised a metal detector to find the bullet, but the device's signal was distorted by the metal bed springs. The bullet was never found and eventually infection caused his death by blood poisoning. Charles J. Guiteau was found guilty of the assassination of the president on January 23, 1882 and was sentenced to death by hanging on June 30, 1882. Facts about Assassinated Presidents. Assassinated Presidents - The Assassination of President William McKinley: President McKinley was shot on September 6, 1901 by Leon Czolgosz. The President's wounds became gangrenous and he died on September 14, 1901. Leon Czolgosz, was an anarchist who had become embittered when he lost his job during the depression that followed the Panic of 1893. Leon Czolgosz was tried and found guilty of killing President McKinley. Czolgosz showed no remorse for the assassination and stated "I killed the President because he was the enemy of the good people - the good working people. I am not sorry for my crime." Leon Czolgosz was executed by electrocution in the electric chair in the state of New York on 20th October, 1901. Facts about Assassinated Presidents. Assassinated Presidents - The Assassination of President John F. Kennedy: President Kennedy was shot and died on November 22, 1963 in Dallas, Texas. The assassin shot the President from a distance, and there were no eyewitness to confirm the identity of the gunman. Lee Harvey Oswald was in the vicinity of the assassination and was arrested by the Dallas Police. He strenuously denied any involvement in the assassination of JFK. On November 22, 1963, Lee Harvey Oswald was being transferred to the county jail. As Lee Harvey Oswald was led through the basement of police headquarters a man named Jack Ruby shot him in the stomach. Lee Harvey Oswald died soon afterwards. Jack Ruby at first stated that he shot Lee Harvey Oswald because "couldn't bear the idea of the President's widow being subjected to testifying at the trial of Oswald". The Warren Commission was established by President Lyndon B. Johnson on November 29, 1963 to investigate the assassination of JFK. The Warren Commission found Lee Harvey Oswald guilty as a lone gunman by the Warren Commission. However, many still question whether more people were involved in a conspiracy to kill the president. Facts about Assassinated Presidents. Assassinated Presidents - The Presidential Curse also known as Tecumseh's Curse is also referred to as the Zero-Year Curse. Tecumseh was the Native American Indian chief of the Shawnee tribe who opposed the US during Tecumseh's War and the War of 1812. The Legend, or curse relating to assassinated presidents, refers to events following the Battle of Tippecanoe that was fought on November 7, 1811, between the US led by William Harrison (later to become President) and the Shawnee leader Tecumseh and his brother Tenskwatawa "The Prophet". The defeat of the Native Americans apparently led to a message to William Harrison, taken as a prophecy, stating that Harrison would die and after him, every great chief chosen every 20 years would also die. William Harrison did become the great chief (President) was elected in 1840 and died in office. Abraham Lincoln was elected President 20 years later in 1860 and was assassinated, James Garfield was elected in 1880 and assassinated, William McKinley was elected President in 1900 and was assassinated, Warren Harding was elected President in 1920 and died in office, Franklin Roosevelt was elected President in 1940 and died in office and finally JFK was elected President in 1960 and was assassinated. Ronald Reagan and George w. Bush were elected President in 1980 and 2000 respectively and both survived the curse and survived their presidencies, however, both were subjected to assassination attempts. A series of amazing coincidences or were the assassinated Presidents victims of the Presidential Curse (Tecumseh's Curse)? List of Nearly Assassinated Presidents!